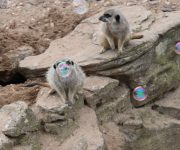 DZG meerkats had a blast bursting bubbles thanks to a generous zoo supporter who bought a bubble machine for our animals. The meerkat mob darted about their den chasing the bubbles and popped them with their noses and paws. The bubble machine was kindly purchased from the Amazon wish list created by Dudley Zoo for … Continue reading Cheers for the bubbles!